Hopwood-based artist Paula Hamilton learns about a quilt exchange. This is rather a lovely story about two groups of quilters, one English and one German, who have produced a set of 40 quilts using fabrics swapped with each other. The story started back in early 2011 when Jill Packer, a keen quilter from Buckinghamshire, answered an ad in The Quilter magazine inviting members to take part in an exchange project with German quilters. Through this, Jill met Anni, a German quilter who worked with the fabrics Jill had sent to her to produce the first of a collection of Anglo-German pieces. The friendship between Jill and Anni led them to want to meet each other in person and so a visit was arranged for Jill to go to Lippetal to see the work of Anni’s group, the Lippetal Quilters, in an exhibition where everything was made from recycled shirts. At this exhibition launch party, Jill was asked if the members of her quilt group would like to swap fabrics with their German counterparts – an exciting idea which would eventually lead to the production of 40 small quilts. It was settled that 20 members from each group would create a quilt from the swapped fabrics. The quilts were to measure 24” by 16”; any method could be used and any combination of fabric was acceptable. May 2013 was to be the date of completion. Meanwhile, in May 2012, Jill and her husband visited Anni and her husband in Germany, where the menfolk walked in the mountains and the women visited an exhibition of quilts and their friendship blossomed. There was a return visit in June when the Anglo-German quilters visited Dublin together, followed by Birmingham’s Festival of Quilts exhibition in August, where Anni’s quilt was on display. Major quilt-related shopping also took place, plus an outing to visit London and its attractions. In May 2013, Jill returned to Germany with the completed “swap quilts” carefully folded into her suitcase and displayed each one to the German quilters, who were able to see the creative way in which Jill and her group had used the swapped fabrics. Jill says, “There was much excitement as I revealed each quilt in turn and I was able to recount stories from the makers. 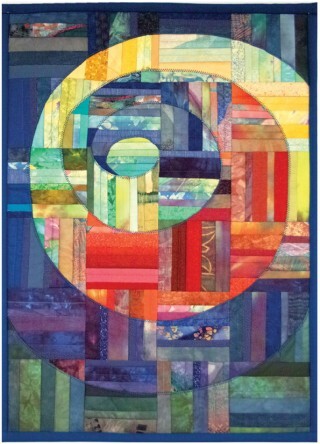 I know the Lippetal Quilters were truly delighted with our work! “This fabric swap between Lippetal Quilters and our group, Gone to Pieces, has started new friendships – and has also given me the chance to travel and see their lovely country. “It has challenged members of both groups to work with fabrics they may not have chosen themselves and I’m sure that most will agree that it’s been a fun and interesting project. We now have the opportunity of seeing the beautiful results of what started as a simple fabric exchange project between Gone to Pieces and the Lippetal Quilters, at Forge Mill Needle Museum. The museum in Redditch is well known as an historic site which records the rich local heritage of the needle and fishing tackle industries – hence the link with sewing, fabrics and quilts.